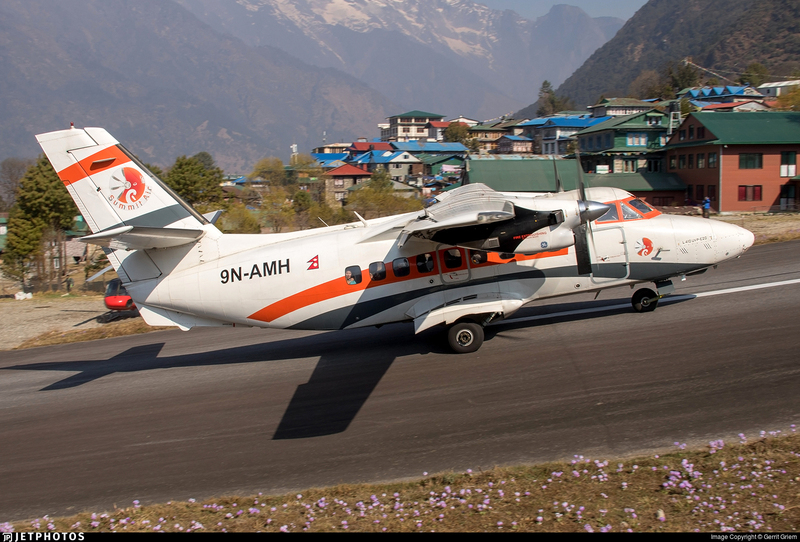 The Let L-410 operated by Summit Air took off from Lukla, Nepal, for a flight to Kathmandu, Nepal. Three crewmembers were onboard. There was no passenger. The plane was taking off from Lukla airport when the aircraft veered off the runway, collided with a parked AS 350 helicopter and destroying it, and came to a stop after colliding with a second AS 350 helicopter. The first officer of the L-410 as well as two security officers on the ground were killed. 4 other people including the captain sustained injuries. The cause of the accident is still unknown. However, Lukla airport is known as one of the most dangerous airports in the world, due to its high altitude, very short runway, very high slope and its mountainous environment. Lukla Airport is located on a mountain at an elevation of 9334 feet (2845 m). The runway is 1729 ft long (527 m) with an 11.7% gradient. Takeoffs must be performed from the downsloping runway. The helipad is located to the right of the runway, about 100 meters past the threshold. The Let L-410 Turbolet is a twin-engine short-range transport aircraft, manufactured by the Czech aircraft manufacturer Let Kunovice. The aircraft is capable of landing on short and unpaved runways. The Let L-410 is regularly used on Lukla airport, in particular for flights from and to the Nepal capital, Kathmandu.